Shopping for Dexter Action Figures? First-ever 3 3/4-inch Dexter action figure! Based on Showtime's hit series Dexter. Features 10 points of articulation. You'll want this good guy / bad guy in your toy box or collection! Bif Bang Pow! 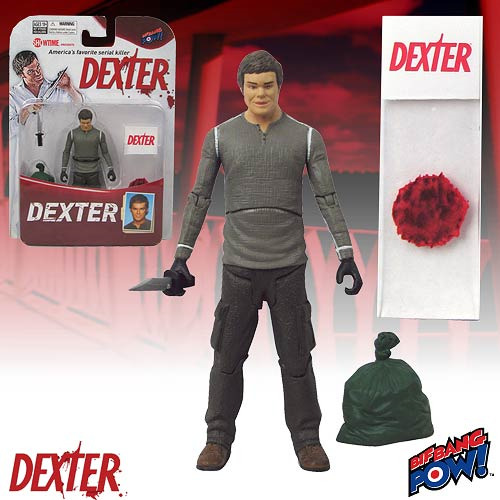 presents a truly awesome 3 3/4-inch Dexter Action Figure based on Showtime's hit series Dexter. This fan-demanded figure is crafted of PVC plastic and features 10 points of articulation. You'll want this good guy / bad guy in your toy box or Dexter collection! Limited edition of 7,000 pieces.